Many people want to invest in cryptocurrencies at present time. The more promising a cryptocurrency, the more ordinary users are interested in it. People are ready to invest their last free money in order to get a substantial profit in a couple of months. Knowing about Bitcoins, we should not forget that there are other virtual coins with potentially high income as well. Let’s review several cloud mining services to earn Monero. CCG Mining is established in 2015 and it has hardware power in Bulgaria. It is rather a mining pool than a cloud mining company. The service works with BTC, ETH, ZEC, BCC, ETC, XMR, and LTC. Merged mining option allows to clients mining different coins without a decrease in hash rate. and 2,000 H/s per 1,459. Automatic payouts to the client’s wallet. All contracts are lifetime and they will work as long as they are profitable. Every day, a tax of 7% and an electricity fee of $ 0.10 / kW are deducted from the profit. If you are thinking about cloud mining of Montero, Genesis Mining is one of the best options. Hash power for mining is located in Iceland. This time-tested company has enough of hush power and earned the customer trust. The project is growing intensively. Genesis Mining, established in 2013, is the main project for cloud mining of Monero and 4 other virtual coins. This service is one of the largest ones in the world, offering hash power for mining cryptocurrencies. The return on investments is about 6 months depending on the chosen plan, as well as the pool settings. All contracts are for 2 years. 4 plans are offered for customers, but each client can develop its own plan. The cheapest plan is Gold with a monthly payment of $ 30. No maintenance fee is charged. 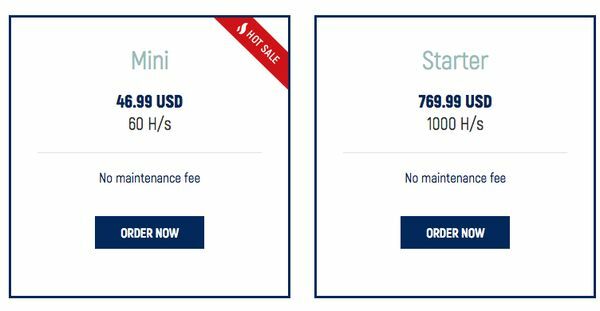 The only drawback of this service is that the contracts are often bought very quickly, and lately, customers can only make pre-orders, waiting from 1 to 3 months without receiving any income during this time. The prices for pre-order plans may not be affordable for everyone. Note that a client needs to contact technical support for ordering power more than 10,000 GH/s. MinerGate is an international multi-currency mining pool existing since 2014. The clients can use the offered hush power or download the offered software with which you can earn cryptocurrency using your own computer. The offered contracts are unlimited with a different hash rate. The calculator is offered to show how much the client will get from the purchasing power per day. Investments are generally paid off from 5 to 7 months. Its reliability and solvency are confirmed by more than 1.5 million investors. A daily fee for service and electricity is taken from the profit. 17 languages of customer support. Almost all cryptocurrencies are available. Unlimited contracts for Monero mining with the minimum hush rate of 10 H/s (0.02269712 XMR). The minimum contract for Monero is 10 H/s at the cost of $ 6.5. The Smart Mining option allows switching to automatic mode and the system starts mining the more profitable cryptocurrency at the moment. The company pays a special attention to newcomers. The first payouts are expected within two days after investing. Actually, Monero (XMR) is one of the most popular cryptocurrencies. It appeared in 2014 and it was first named BitMonero. Now, it features a certain level of trust from users and an impressive capitalization. Monero is a well-known crypto with an open source code. It is based on the CryptoNote algorithm using the ring signature technology. Like other cryptocurrencies, Monero is decentralized and it has no control over itself. It provides complete transaction anonymity for both participants and amounts. If you do not have enough fiat money to buy this coin, you can try to start its mining. 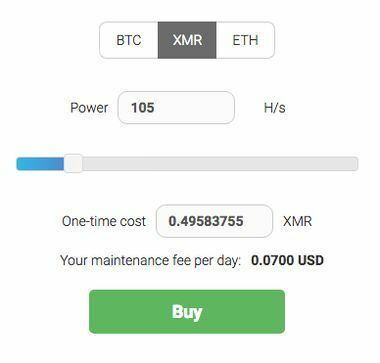 Cloud mining is not a business for free, but it is still much cheaper than the direct purchase of Monero. The very procedure of cloud mining gained a foothold in the market and it causes a great interest now. Monero mining is expected to be over in 2022 and it is still profitable now. Due to the increasing complexity of mining, more and more hush power is needed. Also, Bitcoin contract prices increase significantly with time. Therefore, more people turn to cloud mining of Monero. There is no need to buy expensive computer equipment and bother of its installation, configuration, and maintenance. Monero cloud mining uses the CPU hash power, so even out-of-date hardware can still serve for enterprising users. You can start to mine immediately after purchasing a contract. It is an opportunity to start mining on outer powerful computer equipment with small investments.